The 2018 John Marshall High School varsity football season kicks off on Friday, August 24 at 7:00 pm under first-year head coach Jason Willis. 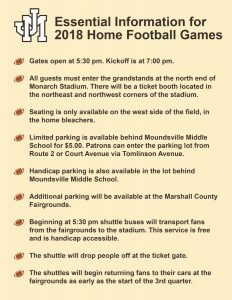 Because the new Monarch Stadium is still under construction, there are a few temporary changes at the Moundsville venue for the upcoming season. The first adjustment is where guests will be permitted to park. Limited spaces will be available behind Moundsville Middle School for $5.00. The same lot will be used for handicap parking. Patrons can enter the parking lot from Route 2 or Court Avenue via Tomlinson Avenue. For anyone attending the game who can’t find a parking space close to the stadium, several shuttle buses will transport spectators from the Marshall County Fairgrounds to the field beginning at 5:30 pm. This service is free and is handicap accessible. The shuttle will drop people off at the ticket gate. The shuttles will begin returning fans to their cars at the fairgrounds as early as the start of the 3rd quarter. Another difference is all guests must enter the grandstands at the north end of the stadium. There will be a ticket booth located in the northeast and northwest corners of the field. Currently seating is only available on the west side of the field, in the home bleachers. The visitors’ stands won’t be constructed until spring. Gates open at 5:30 pm. Kickoff is at 7:00 pm. All guests must enter the grandstands at the north end of Monarch Stadium. There will be a ticket booth located in the northeast and northwest corners of the stadium. Seating is only available on the west side of the field, in the home bleachers. Limited parking is available behind Moundsville Middle School for $5.00. Patrons can enter the parking lot from Route 2 or Court Avenue via Tomlinson Avenue. Handicap parking is also located in the lot behind Moundsville Middle School. Additional parking will be available at the Marshall County Fairgrounds. Beginning at 5:30 pm shuttle buses will transport fans from the fairgrounds to the stadium. This service is free and is handicap accessible. The shuttle will drop people off at the ticket gate. The shuttles will begin returning fans to their cars at the fairgrounds as early as the start of the 3rd quarter.